Andreas Jackson cognomine "Old Hickory" (natus Waxhaw in vico Carolinae Meridianae die 15 Martii 1767; mortuus Nasbirgi in urbe Tennesiae die 8 Iunii 1845) fuit septimus praeses Civitatum Foederatarum. Antea militaris Floridae gubernator et Tennesiae legatus in senatu fuerat. Cole, Donald. 1993. 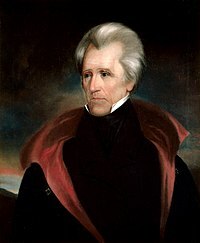 The Presidency of Andrew Jackson. Lawrence: University Press of Kansas. Vicimedia Communia plura habent quae ad Andream Jackson spectant.